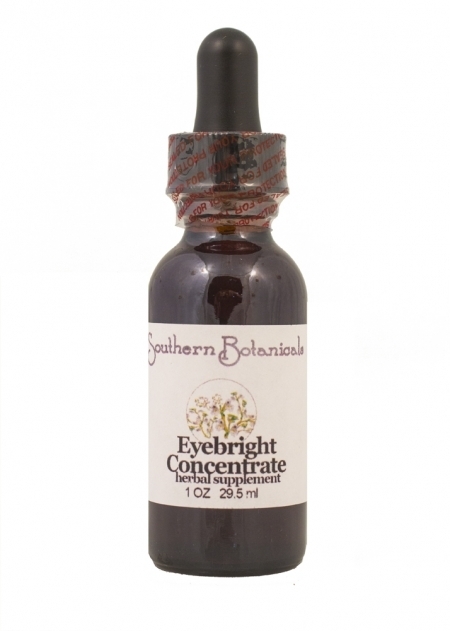 Eyebright Concentrate is a proven, time-tested way to support eye health. Eyes are subject to strain and irritation due to excessive computer use, lack of natural sunlight, infections, poor nutrition, chemical buildup in the body from food additives and environmental toxins, and reading without proper glasses, and use of contact lenses. Supporting your eyes with herbs every once a while contributes to healthy eyes and good vision, which are vital to quality of life. Oxygen is vital to eye health. Our eyes need more oxygen and blood circulation than any other body organ than the brain. The organic and wild-crafted herbs in this tea are renowned for their ability to deliver oxygen to the eyes by increasing blood circulation to the eyes. They are also famous for their ability to soothe and nourish the eyes. Eyebright Concentrate directly assists the eyes by increasing blood circulation, which supplies oxygen to your eyes. Other than the brain, the eyes need more oxygen than any other part of your body. They also need natural sunlight and nutrition from whole, natural unprocessed foods; especially deeply colored foods such as dark green leafy vegetables, tomatoes, carrots, beets, blueberries and apricots. Eyebright Concentrate combines traditionally used organic and wild-crafted plants renowned for their ability to support eye and vision health. I use Eyebright Concentrate when doing a lot of computer work; it seems to help the eyes. - C.J. Miami, FL. My husband has had a great deal of improvement in his eyes since using the herbal eyebright formula, both internally and as an eyewash. He formerly had a lot of pain in his eyes, and mentioned a "squishy feeling" around the eyeballs . . . He can see better now and has no more pain." - R.T. Ingredients (*Organic, +Wildcrafted): Eyebright+, Goldenseal root+, Red Raspberry leaf*, Mullein flower+, Bayberry bark+, Fennel seed*, Rue flower+ and Cayenne pepper* in a base of distilled water and certified organic GMO-free alcohol. Eyebright - One of the primary herbs recommended to promote healthy eyes. Contains astringent compounds that are excellent for mucous membranes. Contains Vitamins A, B3, B5, B12, C, D, and E. Also good support during times of stress. Goldenseal root - promotes healthy normal eye tissues. It is an herbal source of minerals and trace minerals including magnesium, manganese, silicon, zinc, cobalt, and iron, and also has Vitamin C. It supports the immune system. It soothes and support mucus membranes. A side benefit of taking this formula is that Goldenseal stimulates and aids digestion. Red Raspberry leaf - contains astringent compounds that help promote healthy normal eye tissue. Mullein Leaf - lubricates tissues of the eye. Mullein also lubricates the throat, lungs and bronchial passages. It is slightly sedative and is said to promote a sound sleep. Bayberry Bark - has been commonly used to increase blood circulation and stimulate perspiration. It is also good as a natural way to help build up the immune system of the body. Fennel seed - Antioxidant fennel contains nutrients that may promote healthy eyes and good vision. These nutrients include Vitamin A and Vitamin C.
Rue flower - is used to support and stimulate tissues. Cayenne - increases circulation, bringing oxygen to the eye area. This herbal catalyst increases circulation and enhances digestion, thereby improving the overall effectiveness of the other herbs in the formula. Your eyes need natural sunlight for healthy function too. Do not apply topically to eyes. Note: For internal use only. External use can create infections from unsterile topical application. In earlier times, herbalists would use eyebright as an eyewash, but today this is not recommended as it opens the way for contaminants and germs to enter the eyes. Everything used is not sterile (water, water container, eye cup and ingredients), so this practice would be unsafe and cannot be recommended! Herbal Eyebright by Dr John L Christopher Dr. Christopher discusses his herbal Eyebright formula and how he recommended it for internal use , as well as externally as an eyewash. However, he stressed that his herbal Eyebright formula gets results when internal cleansing has been done and a mucusless diet (alkaline diet) is followed, and that healing does not occur without these fundamentals. His testimonials include internal use of eyebright as an herbal supplement. Note: The FDA prohibits the use of herbal dietary supplements for external application. Furthermore, use of the eyebright formula externally as an eyewash is not recommended because any non-sterile application to the eye may cause serious infection of the eye. The following article by Dr Christopher is for educational purposes only.